I know everyone who joined has been on waiting for this. I'm so sorry for the delay, but we were overwhelmed with all the entries. Thank you all for joining! 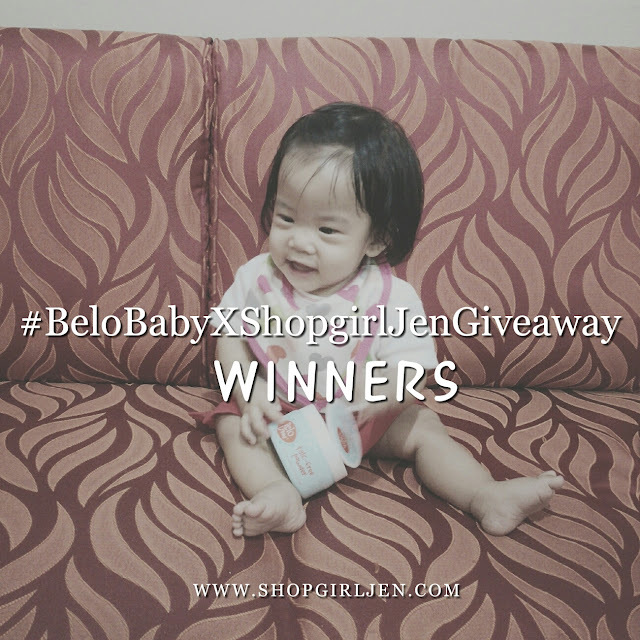 Before I announce the 3 winners of #BeloBabyXShopgirlJenGiveaway, I would like to share again the benefits and why Belo Baby Talc-Free Powder is a must-have for our baby. BELO BABY TALC-FREE POWDER is all-natural with 0% harmful chemicals. It is very safe to use because talc-free products are kind to babies with normal to sensitive skin! For my peace of mind, I will definitely use Belo Baby products. Keep your baby's skin delightfully dry. Its natural, safe, and super easy! It absorbs moisture, soothes, and calms skin for a happy, healthy baby. Comes in a very cute packaging that already includes a soft puff. As a Mom, our baby’s safety and general well-being is our top priority, so I’m relieved that the only skincare I choose to trust now has talc-free powder. Belo Baby – crafted with care for the most delicate skin. For a meticulous mom like me, it has my stamp of approval and I highly recommend it. Congratulations again to all winners! Please email me at shopgirl_jen@yahoo.com with your Name, Address and Mobile Number with subject as Belo Baby Winner within the day. To all who joined, thank you so much! Stay tuned for more giveaways in the coming weeks. Follow me on instagram @itsshopgirljen and Facebook Fanpage for further announcements. Belo Baby Talc-Free Powder is now available in leading supermarkets and department stores nationwide. You can also buy now here: https://tackthis.co/shop/Belo/category/belo-baby. Thank you so much Belo Baby for trusting me to host this giveaway!